Autumn Piper - Got romance? - Free loot! 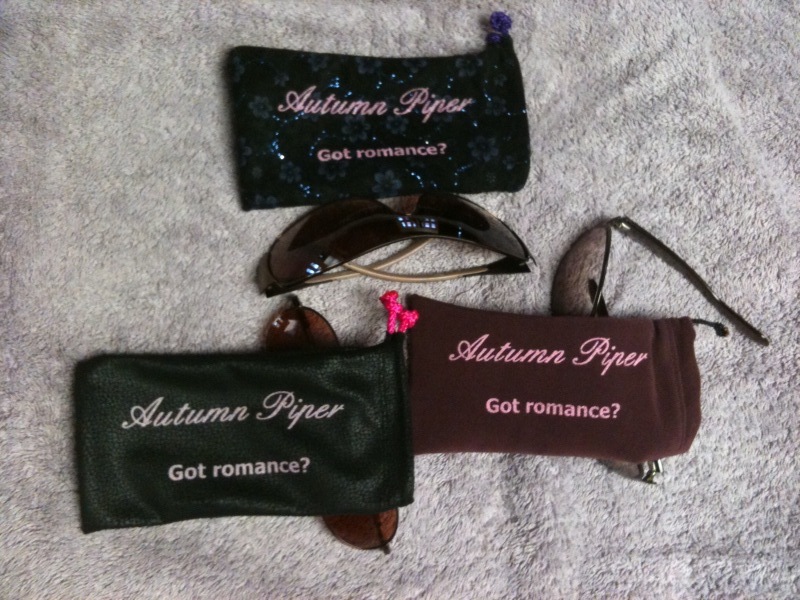 Autumn Piper - Got romance? After much soul-searching, head-scratching, and shopping the net for cheap-but-useless party favors, as well as picking brains of my hubby and my best pal, I decided on shade-saving sunglass sacks as my trade-mark giveaway item. Ever buy a pair of those awesome off-the-rack shades and they end up scratched by, like, yesterday because they don't come with a case? Oh, and have you ever tried to find a case for those bad boys, especially the supermongo oversized, stylin' ones? Well. Look no further, because now you can go incognito scratch-free, like the rockstar you know you really are. Hand-sewn, hand silk-screened, and hand packed, just for you, from one aspiring author attempting to get her name out! Email me at piper.autumn@gmail.com with your snail addy and I'll send you one ASAP. 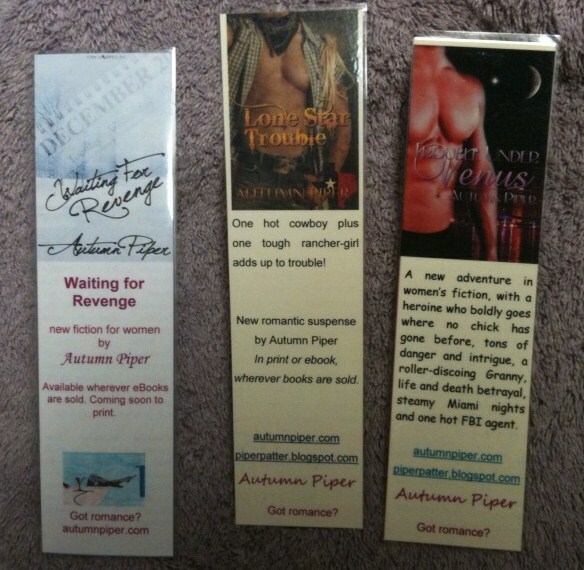 If you'd like to score some bookmarks in addition or instead of the bags, same email address, same deal. Here's a superlame photo of the bookmarks I keep on hand right now. Just cause, you know, I wanted to see if my iPhone would take a good picture of their glossy glory.